Gilchrist County Students Working Against Tobacco (SWAT) Celebrate "Through With Chew Week"! 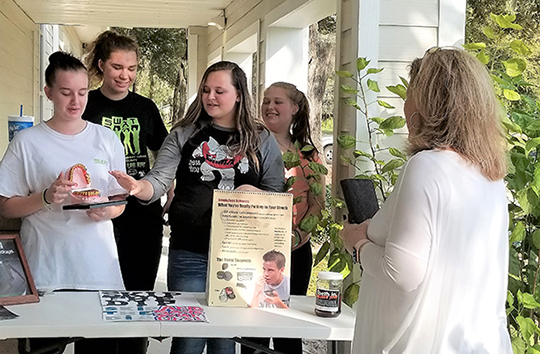 Members of the three Gilchrist County SWAT 4-H clubs participated in Through With Chew Week activities on Thursday, February 21st. Trenton SWAT 4-H members held an after-school community Through With Chew event at the Trenton Library. The club created a display with information such as what happens to the mouth when someone dips, including the white patches that can develop on the tongue or inside the mouth, and the damage that tobacco can do to teeth. SWAT members presented information about the health impacts of using smokeless tobacco products, including the oral health side effects. Using a prop call Mr. Gross Mouth, SWAT members could show youth and adults the damage smokeless products can do to the soft tissues in the mouth, as well as gum, tooth, and bone loss. One of the reasons they chose to do this activity was to raise awareness about smokeless tobacco use. In Gilchrist County, 10.7% of youth ages 11-17 are regular smokeless tobacco users. Statewide, that number is only 1.7%, so SWAT members wanted to raise awareness of the problem and engage community members in discussions about tobacco use. A fact that many people may not know is that anyone who uses smokeless tobacco is more likely to get certain types of cancer, due to at least 28 known carcinogens going into the mouth with every dip. In addition, Trenton Elementary 5th grade teachers shared information with students about the harms of smokeless tobacco to encourage them to not even try the product. The Florida Youth Tobacco Survey actually shows us that young people do start experimenting with tobacco by age 11, and in some cases, they may even be regular tobacco users. When students are exposed to the message that smokeless tobacco is not a healthy alternative to smoking, and is not the “norm” among adults, it can be an important step in changing the social norms among children and youth about using the product. Gilchrist SWAT youth are working hard to help make their generation tobacco free. They know that young people can perceive social norms around smokeless tobacco use as adult acceptance of smokeless tobacco use by young people. So, when they see adults using smokeless tobacco at youth functions, it can send a subtle, yet powerful message to youth. Considering that Gilchrist County youth ages 11-17 use smokeless tobacco at a much higher rate than the state average, it is clear that social norms play a big part in the reason youth start dipping in the first place. We can let our young people know that using tobacco is not actually the norm, and they are expected to be tobacco free, when we create tobacco free events and spaces where young people gather and participate in sports or recreational activities. 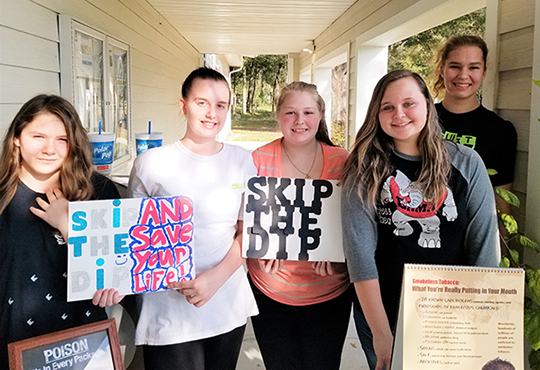 Gilchrist SWAT 4-H club members are doing their part to get the word out to their peers and other members of the community. This is a great time to be Through With Chew! 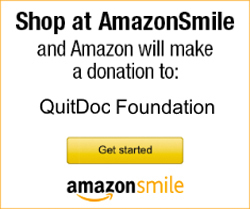 If you would like help in quitting any kind of tobacco, please visit www.tobaccofreeflorida.com/quityourway. For more information about getting involved in Gilchrist SWAT, contact Tracy DeCubellis at 352-463-7006 or at TracyD@QuitDoc.com.